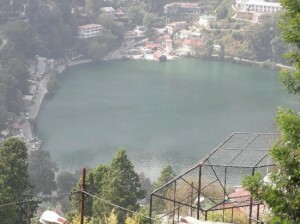 The name ‘Naini’ is derived from an old temple of Goddess Naina Devi, which is located on the shore of the lake. It is believed that Lord Shiva, gone berserk after the death of his consort Sati, strode the earth like a colossus, with Sati’s half-charred body over one shoulder. As he passed over the lake, Sati’s left eye dropped there. The boat club overlooking the lake offers facilities for boating and sailing. Fishing is allowed with permission of the Executive Officer, Municipal Board, Nainital. This entry was posted in Naini, Uttaranchal and tagged naini india, naini lake. Bookmark the permalink.